A small group of descendants and interested town folk walked the beach path to the cemetery hillside for the dedication ceremony on Monday afternoon, July 16. GCIHS President Phil Whitney thanked the Town, Church, and islanders for their support during the project. Pastor Tom Powell gave the blessing, and Archivist Anne Grulich explained highlights of the preservation project before the rose granite memorial stone was unveiled. At long last, the Spurling Revolutionary War Cemetery preservation project is complete. The last lingering piece of this preservation project was the installation of a memorial headstone inscribed with the names of all 26 people known to be interred on the hillside: 13 names on each side. On October 20, 2017, Fred Wieninger barged his truck and equipment out to GCI along with the 1,800 lb. rose granite memorial marker, its base, and steel-reinforced support. Assisted by Stanley Wilbur, Fred also repaired the broken Benjamin Spurling headstone, and placed Andrew Herrick’s new granite marker where his old cedar cross once stood. Visit the cemetery at different times of day. (Look at this gallery of photos and you’ll see what I mean.) Yesterday, the Indian summer morning sun captured the rose hue and crisp black lettering of the memorial perfectly. But in the afternoon breeze, the long autumn shadows of tall pines wavered across the stone in an ethereal salute. I felt strongly that the 26 souls appreciated the tribute. In spring 2018, we plan to have a gathering on the hillside to commemorate these early settlers and thank the Town of Cranberry Isles for its support of this project. Revolutionary War marker for Joseph L’Grow has a revolutionary war figure in the middle. See photo of marker. Two red slate headstones face down and partially covered on all sides for decades are upright now and in fragile condition. We are certain of who the individuals are from LVS research and extant footstones near the headstones that are marked B.S. and F.S. Frances Spurling is wife of Benjamin Spurling, Sr.. Benjamin Spurling, Jr. was their son. Both of these stones are very fragile. Fred is not sure how long they’ll last. 2. Benjamin Spurling Jr. headstone is the second tall red slate, narrower than his mother Frances’ stone. Also badly delaminated. A portion of his inscription remains on the right side of the headstone. Barely legible, but visitor Martha Rose made out this much. “…. of/….IN [perhaps BENJAMIN? ]/……of/….and Fanny/……ling/……d this life/…..29th 1804/……nth and/…..20 days” [Curiously, death date from LVS says 1809. Investigate. 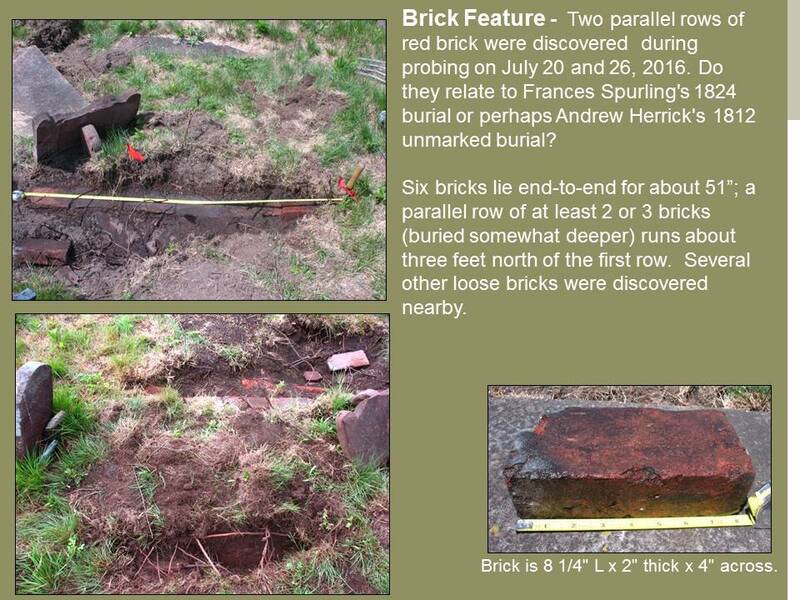 The bricks that were disturbed in previous digging (presumably part of the two short parallel rows along the sides of what is believed to be Frances Spurling’s grave or is it marking Andrew Herrick’s grave?) were put in Benjamin Jr’s burial depression along with other stones. A brick was also used at some modern time to prop up Sarah L’Grow’s headstone. Seems similar to those around Frances burial. Field rocks and stones uncovered during cemetery probing and preservation work were used as fill in depressions. The Benjamin Sr. and Fanny headstones had big rocks in holes near the headstones as if to support them. Not a good idea per Fred as rocks freeze and thaw repeatedly causing weakness around them. Possible makers marks: “100” on Frances Spurling headstone; “3-6” on bottom of Joseph L’Grow headstone; “3-2” on bottom of Sarah L’Grow’s headstone. Robert Spurling stone: Fred and Benjamin dug out the large grey granite base, set it upright, and levelled it. Inserted thewhite marble headstone that had lain buried, face up, cracked in the middle for decades. There is a very large immovable rock to the right of it (woods side). Also, the soil changes color to the right side and becomes distinctly reddish about 2 feet down. Top soil is a rich brown. Flag #46 has a long grave-sized depression running east/west. 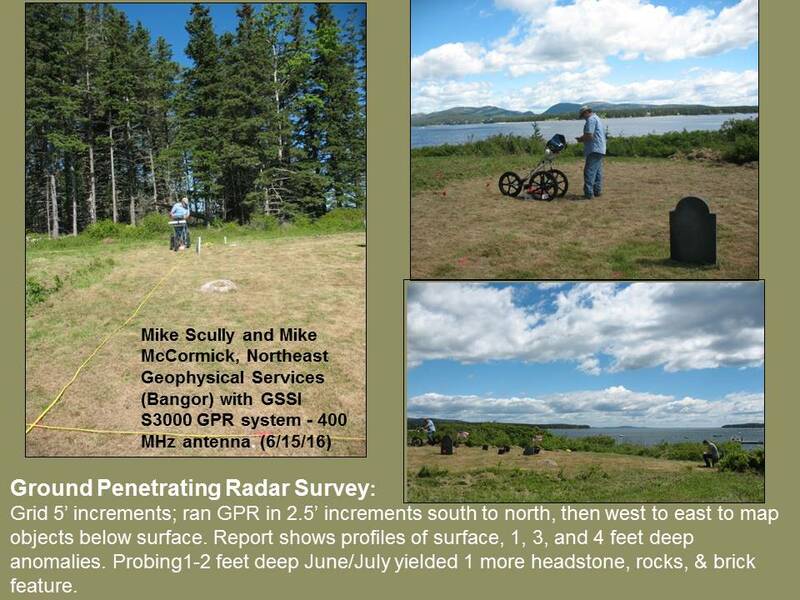 See what GPR report indicates for that spot. William Spurling stone: This broken, loose, marble fragment of this headstone that was propped up on Robert Spurling’s footstone was brought to GCIHS for safe keeping and exhibit. Henry L. Spurling stone was mended to the piece that had been buried for decades. We know from LVS he was son of Thomas and Hannah. The rest of the inscription is illegible so far. Warm muggy morning after a heavy downpour and thunderstorms last night. Jessi Duma and I met at the cemetery at 8:30 a.m. and probed and dug in several more spots for an hour or so. I remained behind to photograph and document our work and discuss the project with two visitors. 2. We uncovered the bluish stone behind Joseph L’Grow’s headstone a bit more. Presumably it’s his footstone but it doesn’t quite match the slate of his headstone. 3. We probed and dug several more flagged areas and discovered only field stones of various sizes. 4. Martha Rose, long-time island visitor, stopped by to chat about the project. She’s the one who first noticed the initials on the two reddish headstones this morning. 5. Tracy Weibel, property owner, stopped by and we chatted about the project and the property. She was enthusiastic. I told her that Maine Coast Heritage Trust had been out to see the project and had given us information on deeds etc. Sunny, dry breezy day 1-3:00 pm in cemetery. (Some updates included in text at later dates.) Probed and dug to probable end of the brick feature. Photographed it and measured bricks. There is a line of 6 bricks end to end that seems to stop at 51″ long. The loose brick measures 8 1/4″ x 2″ thick x 4″ across. The first brick in the row is 8 1/2″ long, probably same dimensions. Several other reddish stone thin broken pieces scattered about in the depression – possibly chips from the nearby headstone on the left side of the brick feature. No brand or markings on the loose red brick. I poured sea water over it and photographed it atop the fallen red headstone. This loose brick is solid and heavy, well-fired brick. I photographed the white broken stone in slightly raking light and it reads in part: “William son of Thomas xxxxx Spurling” (Probably Thomas and his wife who I’ll look up). Broken stone is presently resting against the Robert Spurling footstone. Update 7/28/16: This stone fragment is now housed in GCIHS archives as it was loose and not associated with any other stones at the conclusion of Fred Wieninger’s work 7/27/16. According to LVS, this fragment would be part of the headstone for William Spurling, 2nd: b. 9 Dec 1812 d. 23 May 1839. Son of Thomas and Hannah Spurling. Also photographed broken stone which reads in part: “Henry L. son of xxxx”. Update 7/28/16: Per LVS, Henry L. would be son of Thomas and Hannah Spurling b. 19 Apr 1825 d. 1 Jan 1840. This fragment was mended to the rest of its stone by Wieninger 7/27/16. So far the rest of the stone is illegible. I jotted down these probe results for past days and today. 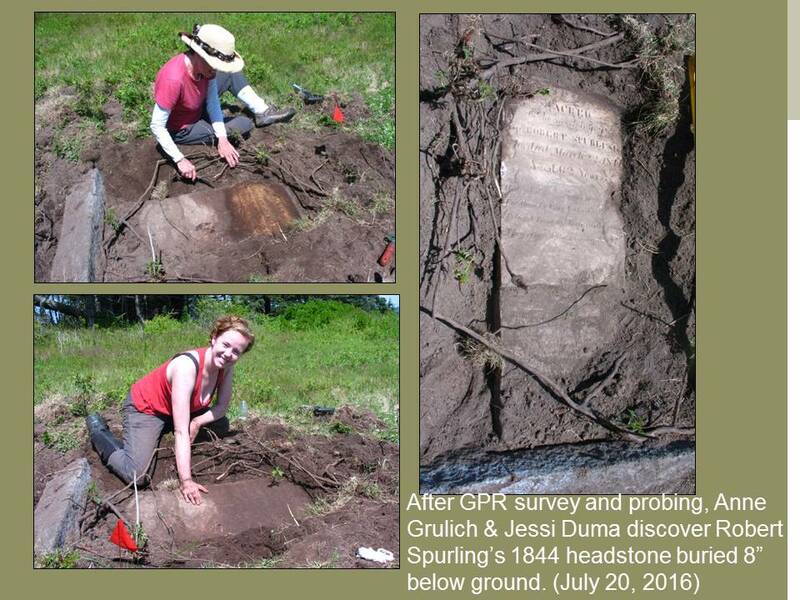 Spurling cemetery probing continued 7/19/16 using the GPR report and intuition. Sunny, windy early afternoon visit, after a rainy day. Used GPR report and intuition to continue search for easily accessible headstones before Wieninger’s visit in the next few days. Brick feature: While probing in hopes of locating the cedar marker for the 1833 burial of Andrew Herrick, I located a feature of bricks between the broken but upright 1836 Benjamin Spurling headstone (3E) and the red slate marker (3D) that’s lying face down, flat to the left of the Spurling headstone. A line of four large red bricks lying horizontally, end-to-end, sloping downward in long depression from about 4″ below the surface to about 6″ below the surface. I had dislodged another brick while probing on an earlier date and had left it in the depression). Does this brick feature outline a burial? Is it possibly Andrew Herrick’s burial as the 2000 photo by Vining shows his cedar marker next to what looks like the Benj Spurling Sr. headstone which was broken and lying flat on the ground at the time? Also, Benj Spurling’s wife Fanny (died 1824) is believed to be buried next to Benjamin. Herrick’s death 1833. Benjamin’s 1836. Herrick family history states there may have been a family connection between Fanny and Andrew Herrick. 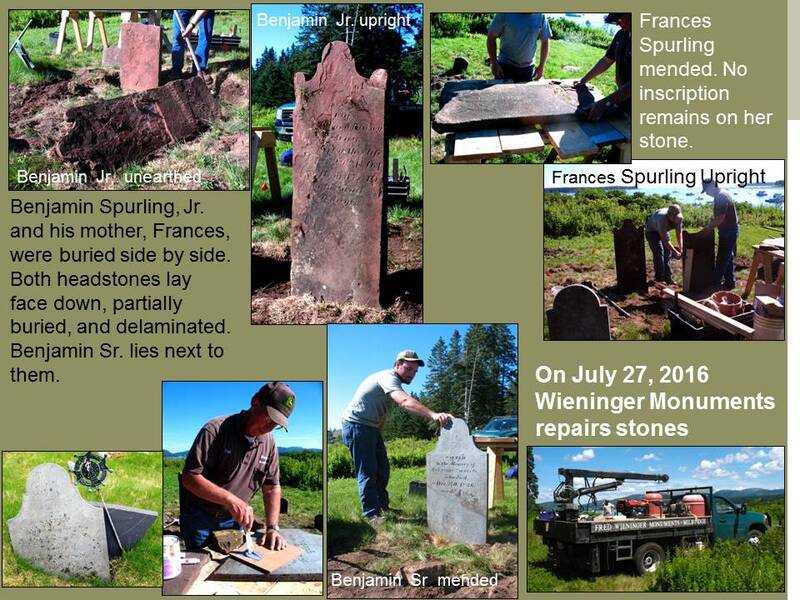 Other probing July 19: Liberated reddish headstone 3D; await Wieninger’s arrival to turn it over. Probed other spots in northwest corner with no findings. Dug around partial head/foot stone 3A. Jessi Duma and I went down to the site at 10:00 a.m. armed with pitchfork and shovels, hand-trowel and hand-fork to further investigate spots 1ft deep indicated on the GPR report. I had gone down Monday afternoon 2:00 p.m. and Tuesday 8:00 a.m. to investigate and do a little shallow digging. I realized it would take brute strength and a big shovel and pitch fork to move the matted, rooty soil accumulation. As suggested by the red diamonds on the GPR report, we dug several holes near several of the red, numbered flags to a depth of about a foot. We looked for Andrew Herrick’s cedar marker last seen 2000 in photo from Tom Vining in which it appears to be next to the Benjamin Spurling headstone. No luck so far. We uncovered a brick in the first spot we investigated. During the weeks of June 6 and June 14, 2016 – Ben Sumner weed-whacked an approximately 40′ x 40′ area of the Spurling cemetery. On June 15, Blair Colby used his disk-mower to clear a wide pathway from the driveway to the cemetery, and he extended the mown area on the north and west sides of the known cemetery by about 15 feet. On Wednesday morning June 15, 2016, Mike Scully, VP of Northeast Geophysical Services, and Intern Mike McCormick spent from 8:00 a.m.-1:00 p.m. in the Spurling Cemetery followed by an additional hour in the Stanley Cemetery on Bulger Hill from 2:00-3:00 to survey three unmarked graves there. The weather was warm, dry, and sunny after several chilly days of rain and fog. McCormick and Scully laid out a 50′ grid and marked 5′ intervals with pink spray-paint. Scully ran the GPR equipment from south to north in 2.5′ intervals, and then repeated the process running the GPR equipment from west to east, and occasionally instructed McCormick on the use of the equipment. McCormick drew a map of the survey area plotting the location of visible features (headstones, footstones, rocks, and depressions). Grulich placed numbered red flags on locations Scully indicated might be burials or features approx. 3-4 feet below ground level. McCormick included the placement and numbers of flags on his map. All of this data will be processed and interpreted back in the NGS office and a 3-D model and draft report will be provided in two weeks. (See NGS proposal June 13, 2016.) (Note: Grulich removed the red flags that had been placed in the cemetery on April 29 to mark depressions and the 33′ x 33′ boundary). See June 15 flag info here. Stanley Cemetery – A quick GPR survey to try to figure out two unmarked graves, one on either side of Alma Stanley Johnson on the left side of the cemetery, and a review of the area surrounding an unmarked grave on the right side of the cemetery was conducted after the thorough Spurling cemetery survey. These three unmarked graves are presently marked with a wood stake, and two of the unmarked graves also have a small granite marker. Scully ran the GPR unit from the southern cemetery fence line north toward the center of the cemetery along the east and west sides of Row 1: Harris Hamor, George and Mary Hamor, unknown, Alma Stanley Johnson, unknown, Birlem. There were small signals on the west (Western Way) side of this row of headstones, but strong signals (i.e. burials) on the east (road) side of this row. Note: The readings on the east side of the two unknown burials are smaller than the readings for the other burials in this row. Row 2 left side of cemetery: Strong but shallow (2′ deep) readings on the east (road) side of the Eliza and Charles Stanley stone. Row 2 right side of cemetery: Inscriptions on this row of Spurling family tombstones are on the west faces of the stones: Clyde, Bernice, Viola, Ella F., Warren A., and Walter F.. The burials are on the east (road) side of this row of headstones. Row 3 right side of cemetery: Inscriptions on this row of Stanley family tombstones are on the west face of the stones: Minnie, Albion, George. The burials are on the east (road) side of the stones. Right side of cemetery near Hazel Stanley Peterson headstone: Yes, there may be a burial just north of Hazel on line with the wooden stake noted above. The burials for the row of tombstones that are in line with the Hazel Peterson stone are on the east (road) side of the headstones. There is a small opening near Hazel Peterson headstone where I placed a red flag on it. The group walked to the cemetery via the public access path along the beach, and left via the path that leads to the access road that Wieninger’s truck would take to reach the cemetery. Using a better camera, Bob Deforrest took photographs of gravestones and rocks that correspond to Anne Grulich’s April 29 photos. He also took photos of depressions, a broad view of the whole cemetery, and photos of the second Spurling family cemetery that lies on the other side of the access road. This cemetery (maintained by Carl Brooks) is in very good condition behind a chain link fence. The MCHT metal detector produced no positive results. Photos were taken at Spurling Cemetery on GCI the afternoon of 4/29/16 by Grulich. Photos were taken from left to right starting in NW corner with Row 1, then Row 2, Row 3, Row 4. The small white disk in photo Row4C_FootstoneBS is a sand dollar. See also pencil drawing made on site 4/29/16 and subsequent chart made on graph paper 5/1/16. Small red flags were placed in a 33′ square as LVS research suggests the cemetery was 33′ square. The locations of the headstones visible 4/29/16 do not correlate with the LVS research or chart. Photos were taken at Spurling Cemetery on GCI the afternoon of 4/29/16 by Grulich. Photos were taken from left to right starting in NW corner with Row 1, then Row 2, Row 3, Row 4. The small white disk in photo Row4C_FootstoneBS is a sand dollar. The cemetery committee met by telephone over the winter because, with no propane delivered to the island in months, there is no heat in the GCIHS Cranberry House. 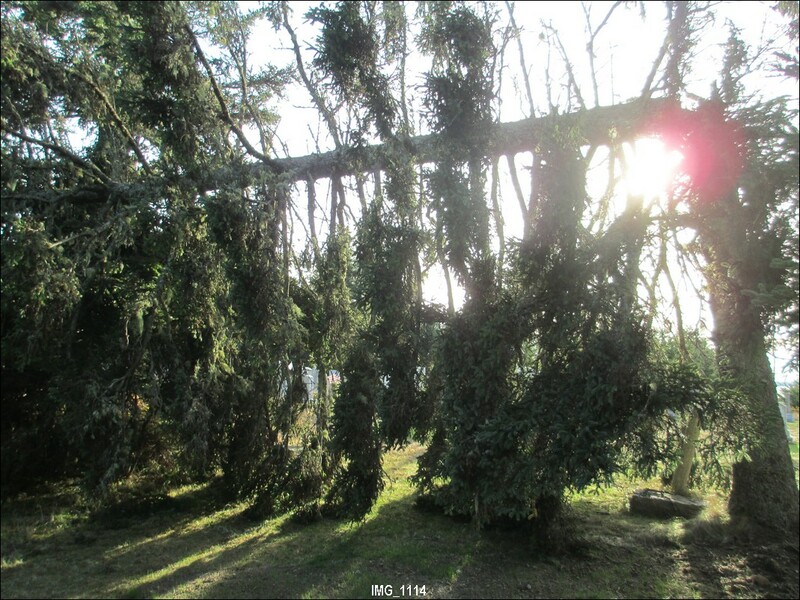 The tree that fell in a November storm will be removed when the weather permits. We are gearing up for fund raising events and tours in the summer when, presumably, the snow will have melted. In the meantime, think Spring, and enjoy the stillness and beauty Jessi’s photos convey. Electricity came back to GCI this morning four days after the first snow storm of the season knocked out the power. One tree fell just outside the cemetery entrance but, thankfully, no stones were damaged. So, take a break, enjoy your lights and heat and some hot cocoa while you explore the gallery of BEFORE and AFTER headstone photos. Peruse the revised spreadsheet that includes lyrical headstone epitaphs and fascinating details about each stone. There is also a chart showing the graves on the left side and a chart of the graves on the right to help you visualize the layout of the cemetery and locate individuals. If you wish to contribute any other info, please contact info@gcihs.org. Eventually, we hope to include photographs and short biographies of the people buried here. As you can see, work on the cemetery is complete; but fundraising continues. We’ve only raised half the necessary funds. We need $9,000 more! Please help if you possibly can. Indian Summer has brought more than just the usual bittersweet sense of seasons changing. Our colleague, friend, and brother, Malcolm Donald, passed away on September 20 at his home on Great Cranberry Island. Appropriately, Malcolm’s will be the first burial in the restored Stanley cemetery, an honor we are certain he’d appreciate. 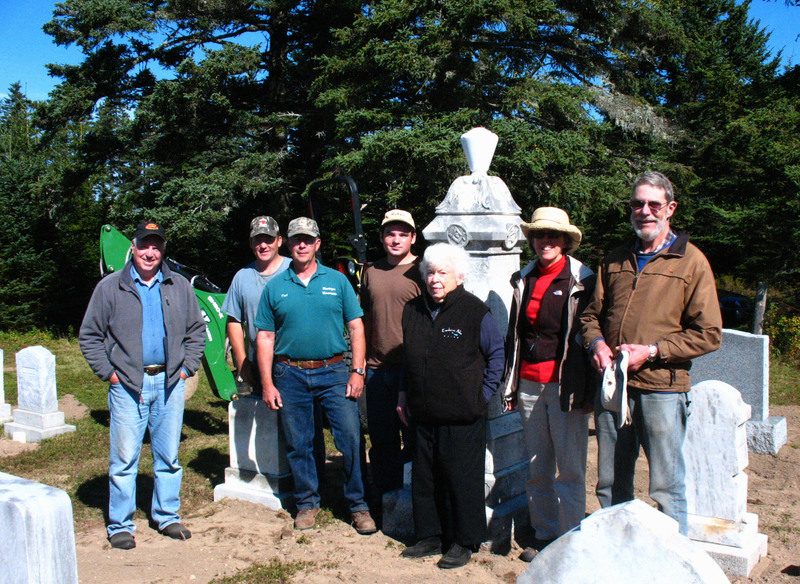 Fred Wieninger completed his conservation work on October 2, and committee members came out to the site to thank him. All of the headstones have been straightened and cleaned, and loam has been distributed to even out the low spots. Next week, we’ll seed the loamed patches to hold the soil in place until the wild cranberries reestablish themselves next summer. We thank John W. Goodwin, Jr. Construction in Southwest Harbor for delivering the loam from the transfer station to the site for free. Take another look at the work in progress and the headstones 2014 as they appeared before work commenced, and some of the headstones as they were in 1999. The inventory of graves has also been revised. Eventually, you’ll be able to compare the 1999, 2014 ‘before’ and 2014 ‘after’ photos seamlessly. I’ll be putting up a complete set of photographs of the restored headstones on the website in the coming weeks. Our cemetery research continues, including a visit to the Jordan-Fernald Funeral Home on MDI, where Debbie searched their post-1896 ledgers for the burials they handled at the Stanley cemetery. And we thank Salsbury Hardware on MDI for their help with our purchase of grass seed this weekend. Fred Wieninger was back out last week with a crew of three. They have made great progress righting the stones and repairing fractures. He’ll be out again this week taking advantage of September’s dry, cool weather. (Click here to see for yourself.) Stage 2, cleaning the stones should begin next week. Fred Wieninger arrived via barge with truck, tractor, and two able-bodied assistants. The weather is clear with a refreshing breeze from the west and the sounds of the surf from below. Folks on the second cemetery tour (every Tuesday at 11:00 through September) were fascinated to be present while Fred discovered a couple of mismatched footstones tucked in and buried by the wrong headstones. In the process of straightening out the large Richardson family monument, they discovered the initials E.L. between two of the base stones. Could this be a maker’s mark? Stay tuned. The GCIHS invites you to tour the historic Stanley Cemetery with a museum guide before and after preservation work begins in late August. Tour dates: 11:00 on Tuesday August 19 and August 26. And 11:00 on Tuesday September 2, 9, 16, 23. Meet at the Cranberry House. Transportation to the site will be provided. If possible, sign up in advance at the museum reception desk or call 244-7800. We need your support. Here’s the poster advertising the tours if you’d like to pass it along to friends and family! A spreadsheet containing information and photos of each of the headstones, unmarked graves, and unused spaces in the Stanley Cemetery has been completed. We’re having technical difficulty uploading it with the photos, but try this link to the complete database for now. Or try one of the two edited versions listing the graves by name, and by year of death. (You’ll have to enlarge the spreadsheet to 100% to read it.) You’ll find inscription, tombstone condition, age at death, measurements, and myriad other details about each burial spot. To see the headstone images that go with the spreadsheet, click here: “Headstones before Conservation“. We have photos from 1999 for many of the graves, and eventually you’ll be able to compare them with the 2014 photographs. There’s a wealth of information to be analyzed. Lastly, read this fascinating article about granite cutters in Maine from the Fishermen’s Voice of June 2014, Volume 19, No. 6.
Letters were mailed to Cranberry Islanders and other interested folks on June 7 – so check your mailbox or peruse our plea here. Our survey of the graveyard began last week. Each grave has been assigned a number corresponding as closely as possible to Leslie Victor Stanley’s baseline 1972 research, and a chart has been developed indicating its location within the cemetery. Specifics like condition, inscription, and measurements have been recorded for a dozen of the headstones so far. Photographs of each grave will be taken this week. A lot has changed in the forty years since Stanley surveyed the graveyard and wrote up his research. We are fortunate to have Bruce Komusin’s 1999 photographs since several stones have slumped forward, face down in the last decade and many inscriptions are weathered and stained – making positive identification difficult without the earlier photo.